Extra, Extra Teresa Collins Designs and a special extra project from DT member Yolie Burke! 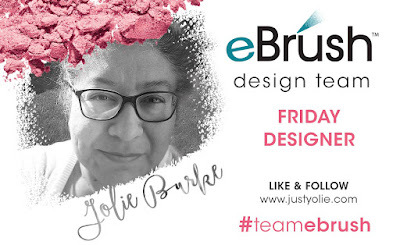 Hello there, this Yolie with Team eBrush bringing you another project with this month's sponsor Teresa Collins Designs. This month we are featuring the Wanderlust Collection. 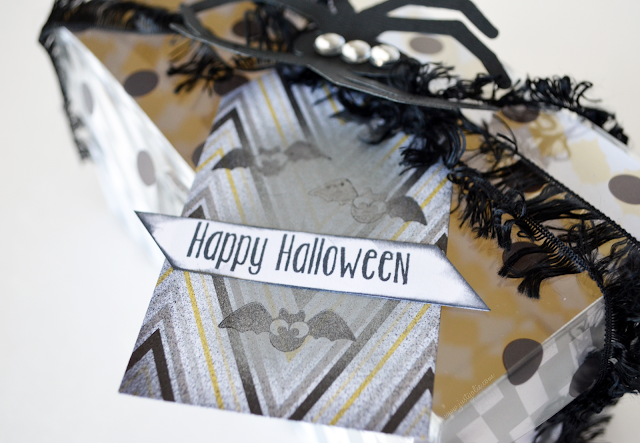 In addition to the Wanderlust Collection, I used Cricut Explore Air, black and silver metallic Sharpie markers; clear rhinestones; adhesive tape, clear dots; modeling paste; ribbon and of course the eBrush. 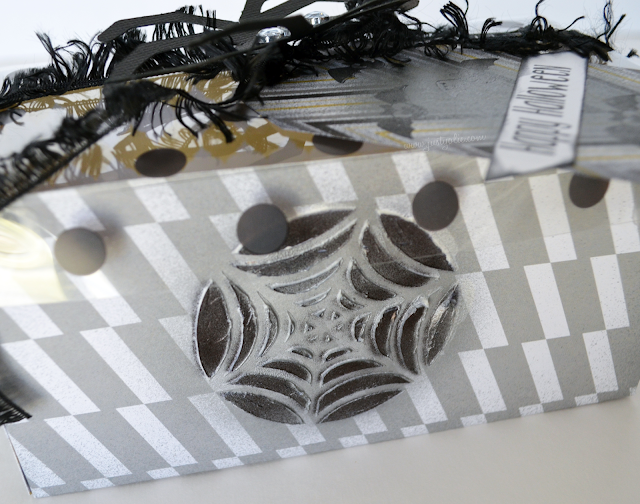 I used the Cricut Explore Air to cut the box, the spider web stencil and spider. 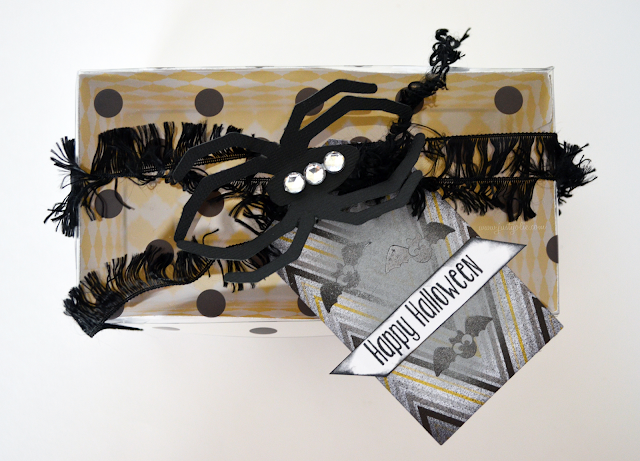 I used the clear Black Polka Dot transparency for the lid and the gray pattern paper for the base of the box. I cut the spider web stencil and spider from scraps. I used paper clips to hold the stencil in place and applied Teresa Collins modeling paste. I waited for the modeling paste to dry and placed the stencil so I can eBrush the image with a black Sharpie. I then cut a tag from Chevron pattern paper and lightly eBrushed it with the silver metallic Sharpie to allow for stamping. I also used the black Sharpie around the edges. Here is my Halloween gift box. 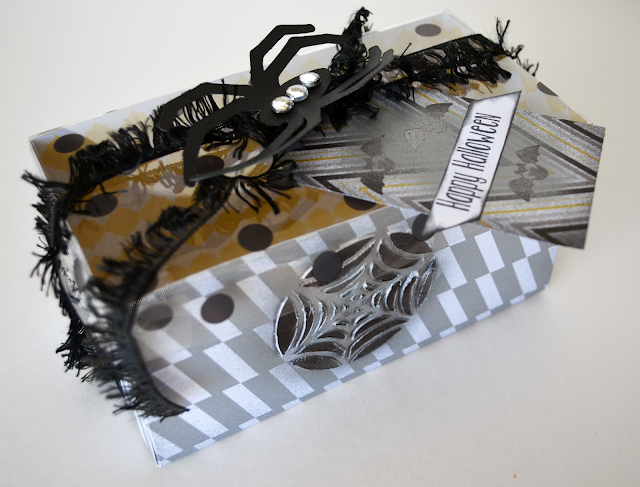 I used ribbon I've been hoarding forever and a day and blinged out the spider just a bit. Here is a close up of the spider web image. The gift box measures 3" h x 6" l x 3.25" d A good size for two small cupcakes or chocolate chip cookies!